Chris J Ratcliffe/GettyMilitary personnel wearing protective suits remove a police car and other vehicles from a public car park as they continue investigations into the poisoning of Sergei Skripal on March 11, 2018 in Salisbury, England. British Prime Minister Theresa May said on Monday that Russia was likely responsible for the nerve agent attack against double agent Sergei Skripal. May said that if Russia didn’t respond that it would consider the attack an “unlawful use of force” on Russia’s part. Two analysts separately told Business Insider that NATO getting involved is unlikely, but that the UK will probably impose sanctions on Russia and expel some of its diplomats to deter Moscow from such actions in the future. One analyst even said that the UK might not even participate in the World Cup this summer. British Prime Minister Theresa May said on Monday that Russia was likely responsible for the nerve agent attack, known as Novichok, against double agent Sergei Skripal in Salisbury, England. “Based on the positive identification of this chemical agent by world-leading experts at the Defence Science and Technology Laboratory at Porton Down … the Government has concluded that it is highly likely that Russia was responsible for the act against Sergei and [his daughter] Yulia Skripal,” May said. 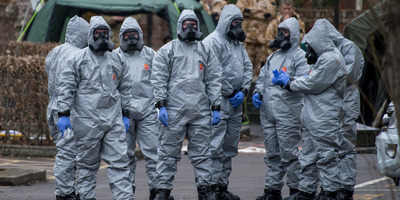 “Either this was a direct action by the Russian state against our country, or the Russian government lost control of its potentially catastrophically damaging nerve agent and allowed it to get into the hands of others,” May said, adding that if Moscow doesn’t respond by Tuesday night that the UK will consider the attack an “unlawful use of force” on Russia’s part. But a nonresident senior fellow at the Atlantic Council, Mark Simakovsky, as well as a senior security analyst for Stratfor’s Threat Lens, Ben West, both told Business Insider that NATO getting involved is highly unlikely. Simakovsky and West each said that the UK will most likely expel a number of Russian diplomats, possibly the ambassador in London, and impose sanctions on Russian officials. This will likely deter the Kremlin from such future actions, and show them “that there will be real costs associated with” these moves, Simakovsky said. Simakovsky also said that the UK could work with the EU to tighten sanctions, publicize information about the attack, limit the access of Russian officials and Russians living in or visiting the UK. 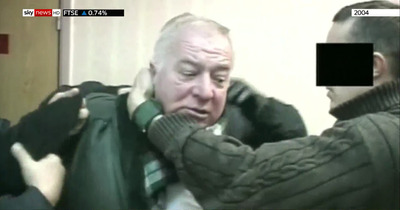 Sky NewsSergei Skripal in 2004, in footage obtained by Sky News. West said that such actions on the part of Russia is an ultimate sign of weakness.